Home / healthy meals / Sweetened verde salsa. I love the versatility of it and I love that it literally takes 5 minutes to do. I usually serve it with fish but last night I decided to try it with grilled Lamb Chops and it was AMAZING! The natural sweetness of the Lamb works so well with the flavors of the Salsa Verde. Definitely a winner!! 2 tsp. Dijon or Wholegrain mustard. 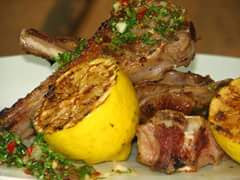 I just marinated the Lamb Chops in some Lemon Juice, Lemon rind, oil and salt and then grilled them on my griddle pan until they were still pink inside (about 3 minutes a side..they were quite small lamb chops). And served them with mashed potatoes and a mixed salad.